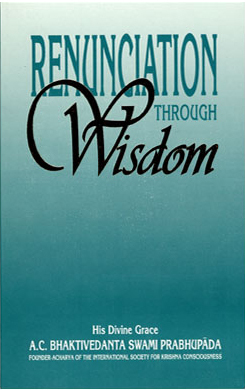 Renunciation Through Wisdom is a collection of essays originally published in Bengali by Srila Prabhupada in India during the 1940s and later translated by his disciples into English. In it he expands on themes found in the Bhagavad-gita; why people are averse to God, the ultimate causes of suffering, and how the world's troubles are extraordinarily fleeting—when seen from the standpoint of eternity. Students of Srila Prabhupada will recognize the same commonsense writing style in Renunciation Through Wisdom as in his later, well-known works such as Srimad-Bhagavatam and Bhagavad-gita As It Is, as well as his expertise at distilling the essence of India's ancient Vedic wisdom into powerful, convincing, practical, and easily readable directives. The grossly materialistic demons are so completely bereft of spiritual knowledge that although at every moment they perceive the transience of the material body, all their activities center on the body. They are unable to understand that the soul within the body is the permanent and essential substance and that the body is mutable and temporary. Becoming first enamoured of then deluded by vivartavada (the theory of evolution), they conclude that the entire cosmic body also lacks a Soul. Since the fallacious theory they apply to their own physical existence leads them to reject any research into the existence of a soul residing within the body, they fail to perceive the presence of the Supersoul within the gigantic body of the cosmic manifestation. They falsely conclude that the body is everything, that there is nothing beyond it; similarly, they think that the material creation, which is the universal body, is factually governed only by the laws of nature. Any discussion on this subject is invariably put to premature death by their insistence that nature is the be—all and end—all. The more intelligent among them carry this discussion a little further and postulate that impersonalism is the quintessence of everything. But far beyond this realm of manifest and unmanifest material nature is the transcendental and eternal state. The atheists, however, are characteristically unable to believe in its existence. In this way, with their perverted minds bereft of far-sightedness, demoniac men perform activities that bring only misery to the people. And as a result of many such unwanted activities, the atom bomb was discovered. The endless plans these demoniac men chalk out can never bode well for humanity. In the past, Ravana attempted to build a stairway to heaven, claiming this was for humanity’s benefit. Actually, he was trying to cheat the Supreme Lord, Ramachandra. But he was unsuccessful. History repeats itself, for now we find that Ravana’s descendants are attempting to cheat the Lord in the name of planning to benefit society. The thing to take note of is that no demon will compliment other demons’ plans. Every demon will declare that since his plan is the most wonderful, all others must vote for him. Then an opponent will say that in actuality his plan is the best and hence he should rightfully be given all the votes. In this age of votes, the fighting over who is to actually get the votes has untimely broken all the stairways to heaven. If one calmly considers the facts, one will easily conclude that all these plans manufactured by the perverted brains of the demons, with their myopic vision, can never bring peace in the world. Of course, in one matter all the demons readily agree, and that is to surreptitiously enjoy Lakshmi, the goddess of fortune and eternal consort of the Supreme Lord, without the knowledge of the Lord Himself. Every demon is vainly proud, thinking no one is more intelligent and esteemed than himself. Therefore the overpowering desires that urge him on to perform various activities are, according to him, ultimately beneficial for human society. In the end, of course, it is inevitably revealed that all his aspirations were illusory and unrealistic. Yet despite this revelation, the demons continue to influence the populace through manipulations and lies. The demons are under the impression that no one is more wealthy and popular than themselves. They think that their wealth will somehow be protected by some spirit, and in this way they are deluded. Their final destination is hell. The few religious deeds that the demons perform are merely a show; they are meant only to flatter their false ego and bring them more recognition and respect. They perform them only for their own sense enjoyment and are invariably acts of violence. The demons engage in these rituals without following the scriptural injunctions, merely to appease their vainglory. Strutting with false pride, strength, anger, lust, and so on, the demons become totally absorbed in bodily consciousness, thinking “This is my body. I am Indian, Bengali, and so on. He is a Muslim; he is a Hindu; he is a German.” In this way they perpetrate acts of violence on others. The Supreme Lord repeatedly puts these most abominable, wretched sinners into the most distressful conditions, constantly punishing them with His stringent laws of nature, or daivi maya. Thus taking repeated births as demons, these reprobates can never appreciate the transcendental pastimes, names, beauty, and so on, of the Supreme Lord. Gradually cultivating the impersonal knowledge of the Absolute, they are destined to suffer the worst possible life. The International Society for Krishna Consciousness (ISKCON) has become well known for its large body of Vedic literature—books on bhakti-yoga that include the Bhagavad-gita, the Srimad-Bhagavatam, and the Chaitanya-charitamrita. These three works by the movement’s founder and spiritual guide, His Divine Grace A.C. Bhaktivedanta Swami Prabhupada, are voluminous commented English translations of Sanskrit and Bengali classics. Remarkably, Srila Prabhupada wrote these and many other, smaller works in the span of twelve years, from 1966 to 1977, while traveling widely and overseeing the growth of the Krishna consciousness movement. What many people may not know, however, is that during the years before he came to the West Srila Prabhupada wrote extensively on Krishna consciousness in his native language, Bengali. In 1976, soon after I joined the Hare Krishna movement, I discovered some of Srila Prabhupada’s early Bengali writings. They were serialized essays that had appeared in a monthly magazine he edited called Gaudiya Patrika. I was so encouraged that I soon collected as many of Srila Prabhupada’s Bengali writings from the Gaudiya Patrika as I could and printed them as booklets under the titles “Bhakti Katha” (The Science of Devotion), “Jnana Katha” (Topics of Spiritual Science), “Muni-ganera Mati-bhrama” (The Deluded Thinkers) and “Buddhi-yoga” (The Highest Use of Intelligence). Finally, I compiled all the booklets into a hardbound book called Vairagya Vidya, which has now been translated in English and titled Renunciation through Wisdom. My close friend and Godbrother Sarvabhavana dasa did the translation, and he has done a very good job. In each of the original Bengali essays Srila Prabhupada’s profound spiritual wisdom shines through, and Sarvabhavana Prabhu has expertly conveyed this wisdom in his translation. When Srila Prabhupada wrote these essays, he was a family man playing the part of an insignificant devotee in the Gaudiya Matha, the Krishna consciousness society founded by his spiritual master, Srila Bhaktisiddhanta Sarasvati Thakura. Yet despite the humble position Srila Prabhupada was taking at the time, his writings mark him unmistakably as a pure devotee. Anyone with an open mind and a gracious heart will see from his writings that Srila Prabhupada was a self-realized soul all along. Like his spiritual master, Srila Prabhupada strictly followed the teachings of Sri Chaitanya Mahaprabhu in his presentation of Krishna consciousness. Those teachings are summarized in the phrase vairagya-vidya-nija-bhakti-yoga [Cc. Madhya 6.254], which means “renunciation through the wisdom that comes from practicing devotional service.” This line from a famous verse by Srila Sarvabhauma Bhattacharya, one of Lord Chaitanya’s intimate disciples, has inspired the title of the present book, Renunciation Through Wisdom. The cowherd boy Krishna milked the cow of the Upanishads [the philosophical essence of the Vedas] for the sake of the calf Arjuna, and the milk that came forth is the Bhagavad-gita. Saintly persons seriously concerned about their spiritual welfare will drink and relish that wondrous nectarean milk. In Renunciation Through Wisdom, Srila Prabhupada has simplified the teachings of the Bhagavad-gita for our understanding. If we drink this nectar, very soon the brilliant sunshine of transcendental knowledge will dispel the darkness of ignorance caused by our unwanted material desires, and then love for Krishna will dawn in our hearts. Transcendental knowledge is eternal; it never becomes dated or outmoded but is always relevant, in all times and places. Therefore, Renunciation Through Wisdom though written forty or more years ago in the context of modern Indian history, can enlighten anyone, in any part of the world. Actually, this wisdom is for everyone, for all time. The Bhagavad-gita is widely recognized as the jewel of India’s spiritual wisdom, but sometimes those unfamiliar with Eastern thought find it difficult to grasp. In Renunciation Through Wisdom, Srila Prabhupada has simplified the teachings of the Gita for our understanding. If we study this book and follow its instructions, the brilliant sunshine of transcendental knowledge will soon dispel the darkness of ignorance, and then love of God—the goal of all spiritual knowledge and practice—will dawn in our hearts.